Oh, this is coming out a bit late for a Skincare Sunday post - I apologize! 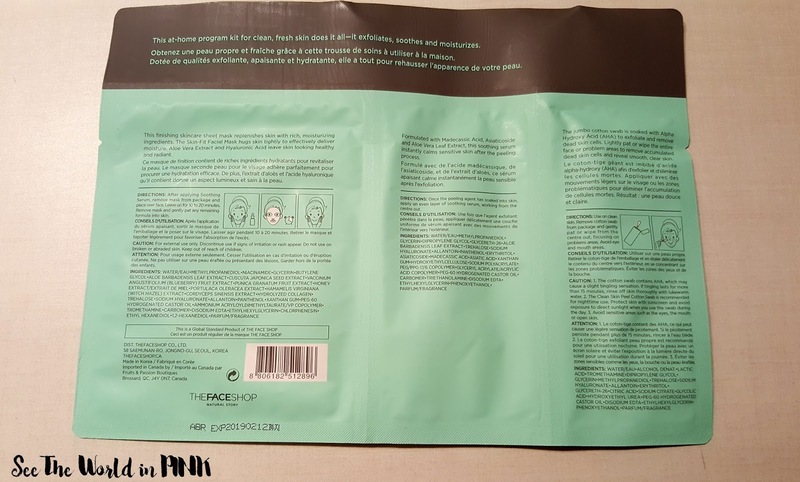 THEFACESHOP Canada just released a new 3-step mask! 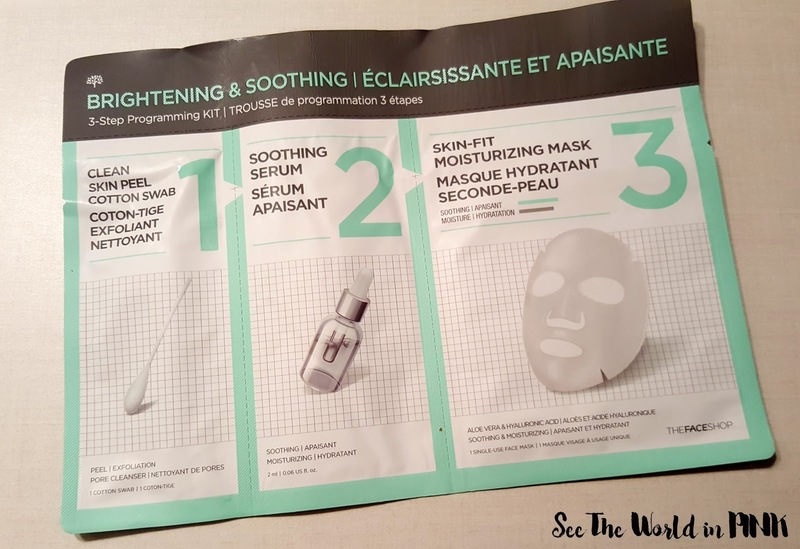 The Face Shop 3-step Programming Kit - BRIGHTENING & SOOTHING ~ $5.00. This at-home kit for clean, fresh skin does it all. It exfoliates, soothes and moisturizes your skin. This face mask consists of 3-steps - a clean peel cotton swab, a soothing serum, and a skin fit moisturizing mask! 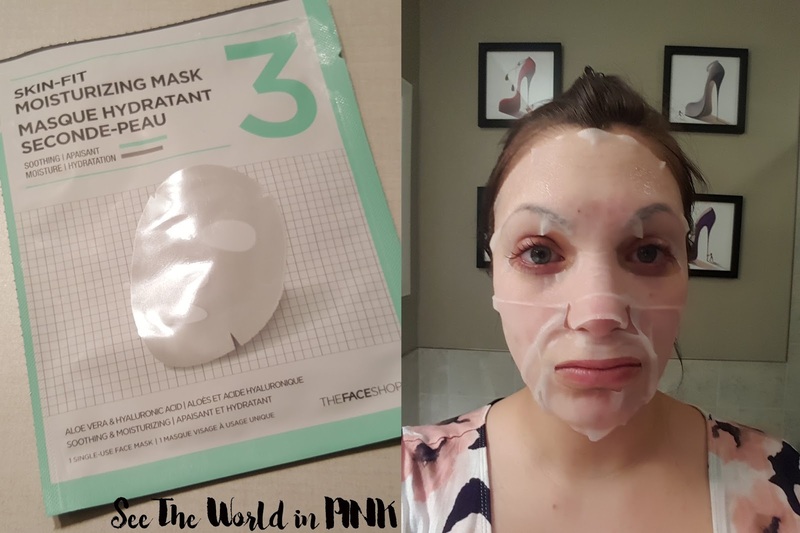 I have tried a couple of 2 step masks, but not a 3 step mask before! 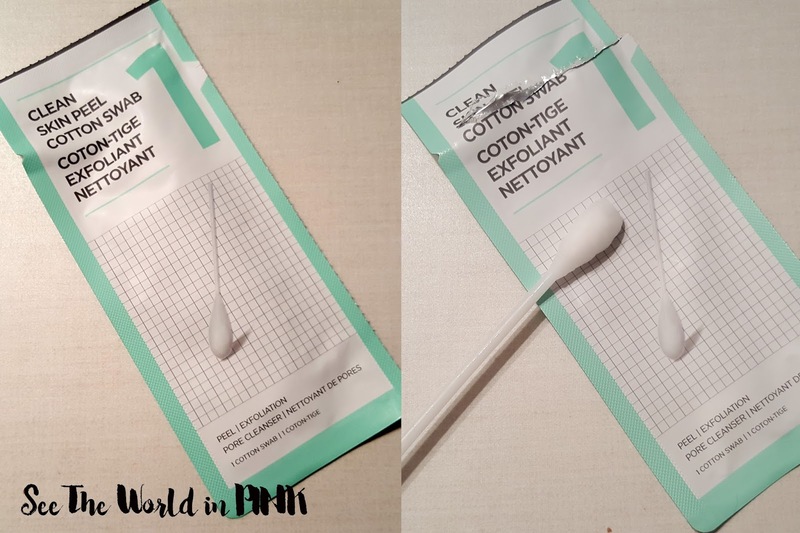 Step 1 Clean Skin Peel Cotton Swab ~ the jumbo cotton swab is soaked with Alpha Hydroxy Acid (AHA) to exfoliate and remove dead skin cells. Lightly pat or wipe the entire face or problem areas to remove accumulated dead skin cells and reveal smooth, clear skin. I have never seen a peel like this before - and it does not peel off the skin like your typical peel. I liked that this was an option for spot treatments or the cotton swab was soaked enough to cover the whole face. I washed my face thoroughly before using this 3 step mask and then I used it all over my whole face and payed particular attention to my trouble spots. Step 2 Soothing Serum ~ Formulated with Madecassic Acid, Asiaticoside and Aloe Vera Leaf Extract, this soothing serum instantly calms sensitive skin after the peeling process. I like that this mask includes a soothing serum as the step after the peel - adds an extra later of comfort and soothing on the skin. 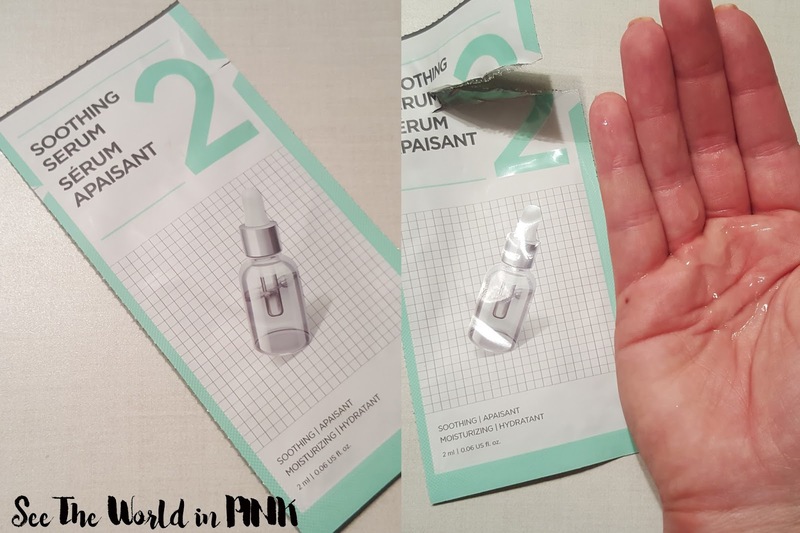 I was expecting a little more serum than what was in the package (just what is in the photo), but it did thoroughly cover the skin. The serum was very gel-like and was very calming, cooling and soothing on my skin! Step 3 Skin-Fit Moisture Mask ~ This finishing skincare sheet mask replenishes skin with rich, moisturizing ingredients. The Skin-Fit Facial Mask hugs skin tightly to effectively deliver moisture. Aloe Vera and Hyaluronic Acid leave skin looking healthy and radiant. This mask applies like all other sheet masks - it is quite soaked with essence and there was a bit of extra essence in the package. The mask is a nice then material and fits my face very well. This mask suggests to use for 10-20 minutes, but this lasted well over 30 minutes on my skin. After I removed the mask, I completed my skincare routine! Overall, I quite enjoyed the 3 steps of this mask - I like having a specific soothing mask and serum to use after exfoliating/peeling the skin. I was really impressed with the sheet mask and I was very happy with the results on my skin. I thought my skin looked and felt better the next morning! I would repurchase this as a treat mask for my skin. I would suggest that you test on your skin first as this does include a peel and may not work for every skin type - but I have sensitive skin and found the peeling step to be quite gentle on the skin. Have you tried this new 3-step mask yet? This is something I want to try now after reading your review! awesome - I really liked this mask! my skin has been struggling too so anything is good that adds more moisture!